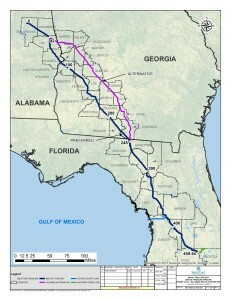 When this project process first began, Florida newspapers, such as the ones in Martin County, Gainesville, Ocala, and others, ran the story with a map of the proposed pipeline, from FPL, plainly showing the route running from Alabama straight to Florida completely bypassing Georgia. The now “preferred” route runs approximately 156 miles, or more through Georgia. Sabal has not been forthcoming, even in their Resource Report 10, as to the reason for the change. Has there been any encouragement from any governmental entity, State or Federal, for Sabal to reroute this pipeline through the state of Georgia? If yes, which entity and why? If no, why did FERC allow Sabal to change routes? Cost would be an invalid answer. Offshore deepwater LNG import project Port Dolphin was approved by FERC in 2009, despite interventions by a long list of other pipeline companies, FPL, and other entities. FERC granted Port Dolphin permission to interconnect with Gulfstream and Florida Gas Transmission, the two pipelines FPL requires Sabal Trail to connect to. What if Port Dolphin files to export LNG, as so many other import-permitted projects are doing?